Events in Ukraine are moving at a terrifying speed. This statement was prepared by the editors of the OpenLeft in the morning of March 1st, 2014. Today, March 2nd, at 2 pm, Russians in different cities will hold rallies against a possible Russian intervention into Ukraine. The Ukrainian peninsula has had the misfortune of finding itself on the intersection of Russia’s imperialist ambitions and the brute nationalist politics of the “new” Ukraine. Open Left declares – the Crimean self-determination movement precedes both the imperialist games and the nationalist frenzy. Today more than ever before it is necessary to call a spade a spade: what’s happening in Crimea these days is a classic act of imperialist intervention on the part of the Russian state. It is a stupid, cowardly, and inconsequent intervention – which is also how Vladimir Putin’s regime itself can be described. We can see that the plan to pressure Ukraine is being written on the go: two weeks ago, the Kremlin, without thinking about the consequences, was pushing Yanukovich toward the most brutal forcible dispersal of the Maidan; a week ago it was supporting the failed “separatist” congress of the disoriented state officials in Kharkiv, and right now they are playing the “Crimean card”, seemingly long forgotten over the past decade. The first two plans failed: the first quickly and bloodily, the second one almost immediately and shamefully. It’s difficult to say how exactly the Crimean one is going to fail, but it is doubtless that it will. The Russian State has demonstrated repeatedly how quickly it can give in its allies. And from the very beginning of the dramatic development of the Crimean situation the Kremlin has also been leaving distinctive markings of potential retrieval. Despite the fact that the Russian troops have taken over a number of strategic facilities and are virtually controlling the airspace above the peninsula, the official position remains that what is happening is merely an “internal conflict” and planned military training. Viktor Yanukovich cannot be relying on Russia’s solid support. With his dual status of, at the same time, a legitimate president and an international criminal, Yanukovich was apparently giving a press conference in Rostov in some third, middle role. The new Crimean leadership, elected with Moscow’s direct involvement, also remains a hostage of the situation. The question put to referendum on May 25th is leaving a large array of possibilities for further shadow trade – both with the main imperialist players, the US and the EU, and with the new Ukrainian government controlled by the old oligarchic partners of Kremlin from Yulia Tymoshenko’s circle. Responding “yes” to that question (which the overwhelming majority of the Russian-speaking Crimean population are obviously ready to do) can, in its most radical version, lead to the re-installment of the autonomous status of Crimea that existed in 1992, which in the contemporary circumstances will turn the region into a permanent source of internal tension in Ukraine and will guarantee the impossibility of it joining NATO in the foreseeable future. This autonomous Crimea will find itself in a constant economic and political dependency on Russia, while its inhabitants will be deprived even of those formal rights that Russian citizens possess. In the case where, by using the “Crimean card” for the effective blackmail of the senior Western partners, Moscow will be successful in redistribution of power within the new political order in Ukraine in general, nothing will change in Crimea whatsoever (with the exception, maybe, of Serguei Aksyonov and his colleagues from “Russian Unity”, who will possibly also have to move to Rostov or Barviha). In any case, the outcome of the referendum, as in general with the fate of the populace of the Crimea (not only Russian but also Tatar and Ukrainian), will be decided behind closed doors. The population’s right to self-determination will remain trampled for as long as the Crimea, and Ukraine as a whole, remains a zone of conflict among external forces – both from the West and from the East. The slogan of “federalizing” the country, with which the politicos from the Party of the Regions are accustomed to speculating irresponsibly, would in normal circustances be the most just solution for Ukraine, with a population that is heterogeneous in cultural, national, and linguistic respects. The principle of federation in a multi-national state has been a democratic means of reducing conflict at such times when each of its constituents is guaranteed equal rights and the freedom to adopt measures at the local level. However, the modern history of Ukraine testifies to the fact that in a weak state this slogan signifies nothing more than the delineation of spheres of influence among its more powerful neighbors, each of which is interested in the continued escalation of conflicts and differentiation, and not in neutralizing them. For actual democratic federalism the development of the Ukrainian revolution towards genuine popular power is required, and not the ongoing usurpation of power by somewhat renovated elites or nationalists. The problem of the Crimea was not dreamt up by the Russian authorities a week ago. The tens of thousands of people who came out onto the streets of Sevastopol clearly perceived a hostile signal from Kiev, where the majority of the victors in the Verkhovna Rada voted to change the law on regional languages. Notwithstanding the unconvincing arguments regarding its legal imperfections, this resolution had only symbolic significance. In a country standing on the brink of economic collapse, the new authorities decided to cloak the coming wave of “unpopular reforms” with a full portion of nationalist speculation. For the ultra-rightists from Freedom (Svoboda) Party who initiated this resolution, the question of language is a part of a large-scale reactionary program for an ethnic state, which has the potential to bury Ukraine in its current form. This resolution, set against the backdrop of the rampage of the “Right Sector” (whose main media partner continues to be Russian television), has become an important factor in the worsening of the situation. This “Crimean scenario” will not last long. The Kremlin elites will quickly play it out in their own interests. The patriotic vuvuzelas, in which teams of propagandists blew at the command, will die down. The passive “office hawks” who called frenetically on their social media pages for the return of “our Crimea”, will fall silent and turn to other, fresher and more interesting topics (as during the Georgian war in 2008). 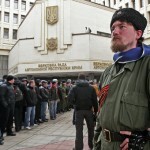 Only the residents of the Crimea – the Russians, Tatars, and Ukrainians – will be left alone with their problems. The inhabitants of this depressed region, regardless of the flows of tourists and the presence of military bases, will remain squeezed between the right-wing politicos from Kiev, the “defenders of the Russians” fed by local oligarchs, and the cynical maneuvers of the Russian state, which spits on the rights and freedoms of its own 143 million citizens. Today it is very difficult to evaluate and predict the actual consequences of the Kiev Maidan. It has led both to the resurgence of the oligarch clans suppressed by Yanukovych, and brought about victories for the popular grass-roots movement that were unthinkable for the post-Soviet space. Maidan has opened the sluices of activity of the far-right thugs – and at the same time has spurred to political life great masses of people, who perhaps for the first time perceive that they themselves are capable of determining their fate. This range of possibilities has the potential to resolve itself both into progressive social changes, and into the victory of extreme reaction. But the final decision must, without doubt, be left to the people of Ukraine themselves – whether in Kiev or Lvov, or in the Crimea or Donetsk. Translated from the Russian original by Kristina Mayman and David Brophy. What are the Ukrainian working class doing? Are there any left forces in Ukraine and are there any left forces in Russia and can the two of them come to a united position? What steps can be taken to prevent a war from breaking out? If war does break out should the left in Ukraine and in Russia be calling for a position of revolutionary defeatism of their respective regimes and turning the inter-imperialist war into a civil war? 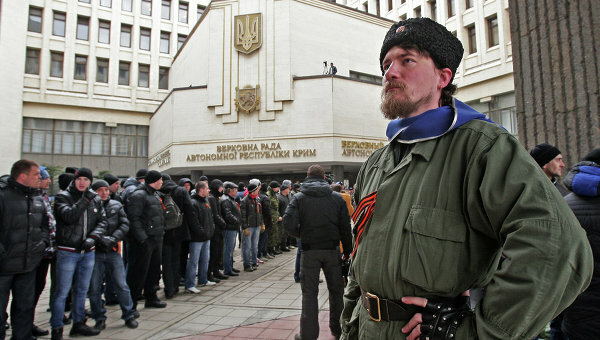 There are multiple left organizations in the Ukrainian region active. The only thing is many are small and have severe problems in certain areas with right-wing militants. People are trying to do what they can. Some groups are that also gave statements are the Autonomous Workers Union (http://libcom.org/news/autonomous-workers-union-statement-russian-intervention-02032014) and the KRAS (part of the IWA (international Workers Association) http://libcom.org/news/autonomous-workers-union-statement-russian-intervention-02032014). The latter link has an interesting statement against the war which i suppose is being distributed – hopefully beyond borders and to the military too (which will probably be difficult). Thank you @WithDefiance. I look forward to deepening my engagement and solidarity with you and other socialists on this website. thanks for this article. i translated it into persian & put it in my weblog. Pingback: LabourNet Germany: Treffpunkt für Ungehorsame, mit und ohne Job, basisnah, gesellschaftskritisch » Um die Krim?